Yesterday we had the pleasure of welcoming the students of the Arctic Studies Programme of the University of Lapland at SGO. Above the group photo in front of the 32-m EISCAT VHF radar receiver antenna. The students were very interested in our observatory. They had specifically asked for a presentation on the topic of light in the Arctic and in general, which was at the same time a challenge and lots of fun to prepare. 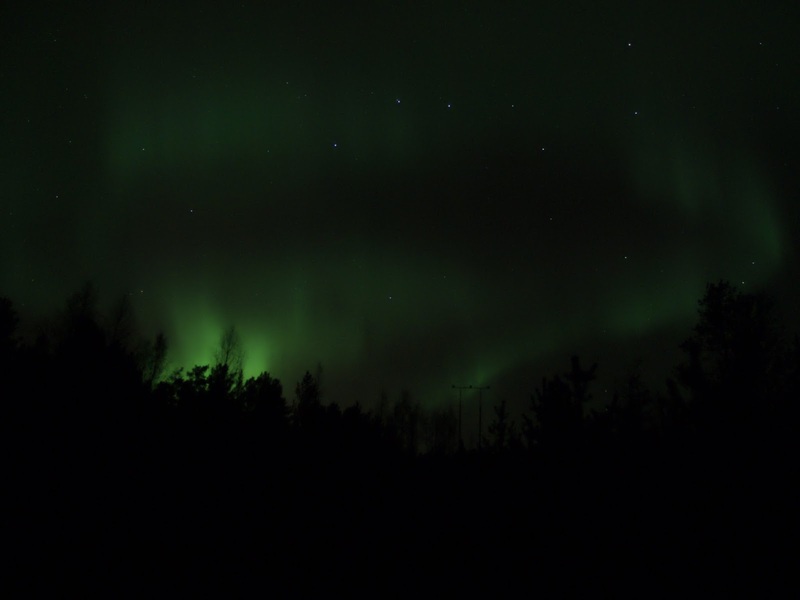 Of course one part of it was an introduction to the science of the Northern Lights. 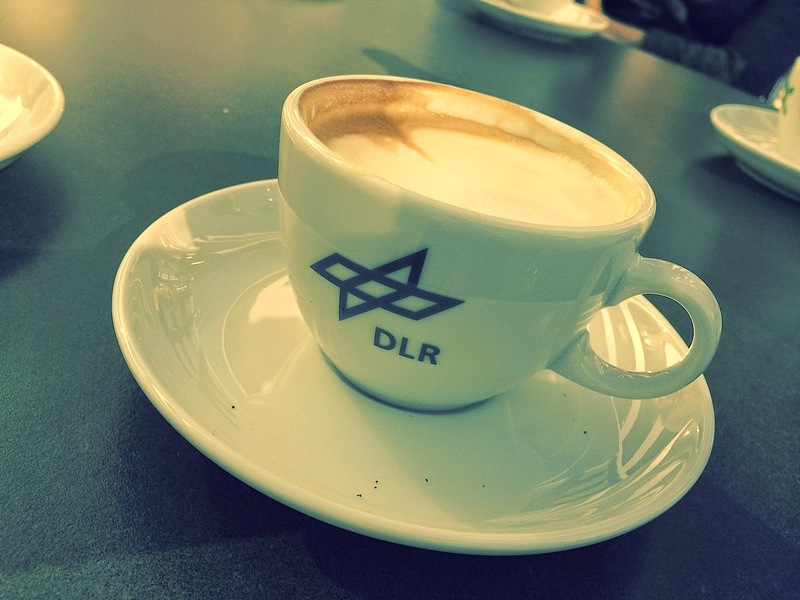 German Aerospace Center (DLR) is a major national research institute comprising a wide range of research related to everything that flies from aviation to the German space program. Middle-atmospheric research group of DLR invited me for a 1-week research visit to their station at Oberpfaffenhofen at Munich. We are collaborating in modelling of the so-called "meteor smoke particles" and their influences on the atmospheric chemistry. 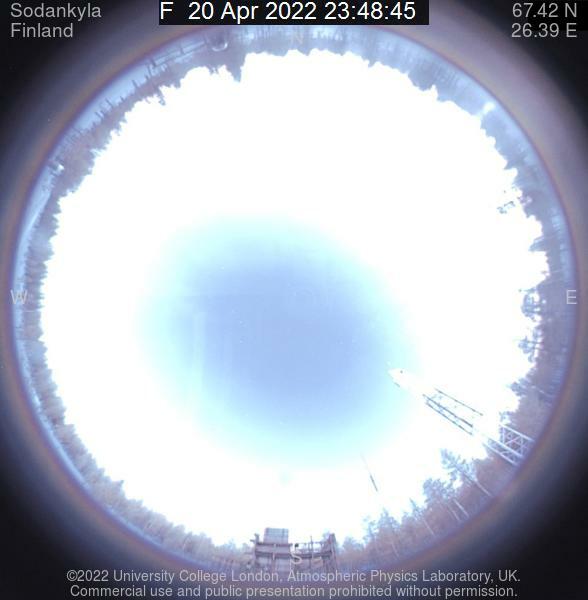 The task is to include the meteor smoke particles as a part of the Sodankylä Ion-neutral Chemistry model (SIC). In the control building of GALILEO navigation satellite! Well this is rather tedious. An easy way to implement Brainfuck software is to use an R-interpreter - click here! The second weird language is the ArnoldC, a programming language which uses Arnold Schwarzenegger bunchlines, i.e. 'I'LL BE BACK', 'HASTA LA VISTA, BABY' or 'YOU HAVE BEEN TERMINATED' -- and yes,.. all in CAPS! There's quite many other esoteric programming languages, hence you can go for Shakespeare or Chicken. If you are bored this weekend and looking for some programming fun, I truly recommend these languages! 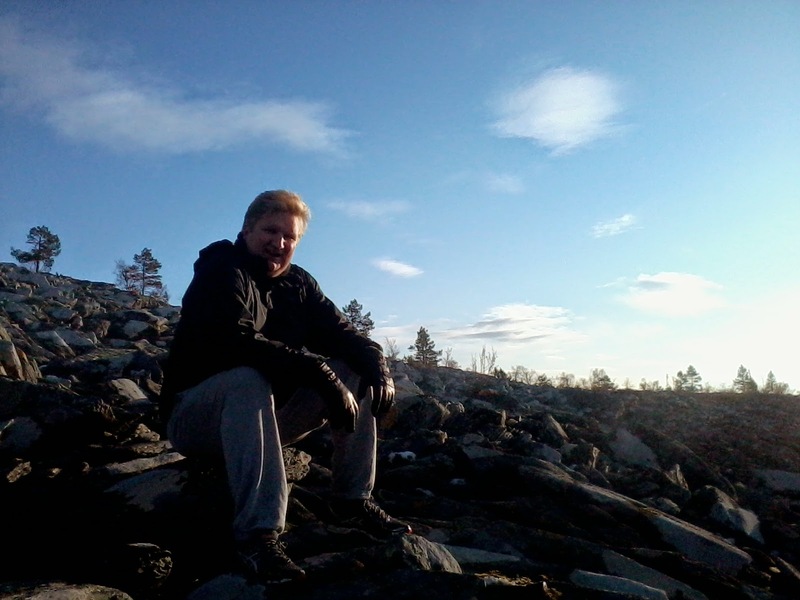 Edit: After writing this web log posting, Petteri told about the 'The Unlambda Programming Language'. Petteri's version for the "10 goto 10" in the Unlambda: "```sii``sii" or without the identity mapping "```s``skk``skk``s``skk``skk". Right on... This is a rather personal web log posting. I don't like sleet, I don't like slush, I don't like soft grey skies... Hence, on Tuesday, we had nice crispy weather with clear skies and +4C degrees. Hence I and Derek went up to Oratunturi. This is the closest proper tunturi to Tähtelä, meaning that on the summit there are no trees (spruces, pines, birches).... Well... that's the definition - you may feel free to debate on the definition. Man with the cane and the 200-euro - Asics shoes - i.e. the "professional"! 17th EISCAT International Symposium and 42nd Atmospheric Studies by Optical Methods will run concurrently 14-18 September 2015 in Hermanus, South Africa. The local organiser in SANSA (South African National Space Agency). More information to follow soon in the event website! Observatoriolla työskentelyn yksi tärkeimmistä, ellei eittämättä tärkein, vuoden kohokohta on jokavuotiset kesäkuussa pidettävät Sodankylän elokuvajuhlat. Monet yhteistyökumppanimme tulevatkin Sodankylään tänä ajankohtana, jolloin voimme tehdä tutkimusyhteistyötä ja nauttia samalla tapahtuman ainutlaatuisesta ilmapiiristä. Tänään kuulimme yhden elokuvajuhlien perustajan, Peter von Baghin kuolemasta. Elokuvajuhlat ovat perinteisesti henkilöityneet juuri häneen. Hänen muistoaan kunniottaen, muistelemme tänään observatoriolla häntä. Erityisesti muistelemme hänen viimeiseksi jäänyttä aamukeskustelua Aki Kaurismäen kanssa Sodankylän elokuvajuhlilla 2014. 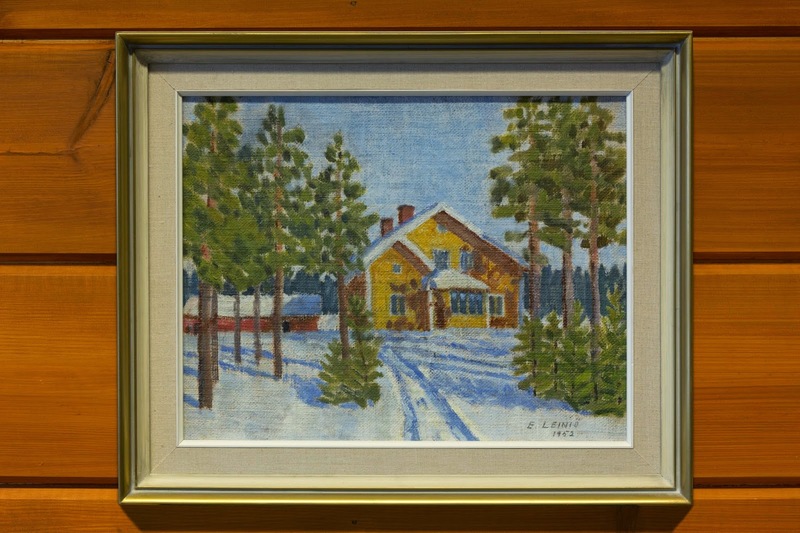 Yesterday 20 September, two children of a former director of SGO offered the following painting of the now dismantled main building, painted in 1952 by Ernst E. Leiniö. The painting (Photo: Thomas Ulich). That building was located near the present library and administrative offices, in the northern part of Tähtelä. It was used as the main building until the 1980s, before the offices were moved to the administrative building and the ionospheric station, which is situated in Tähtelä-south. 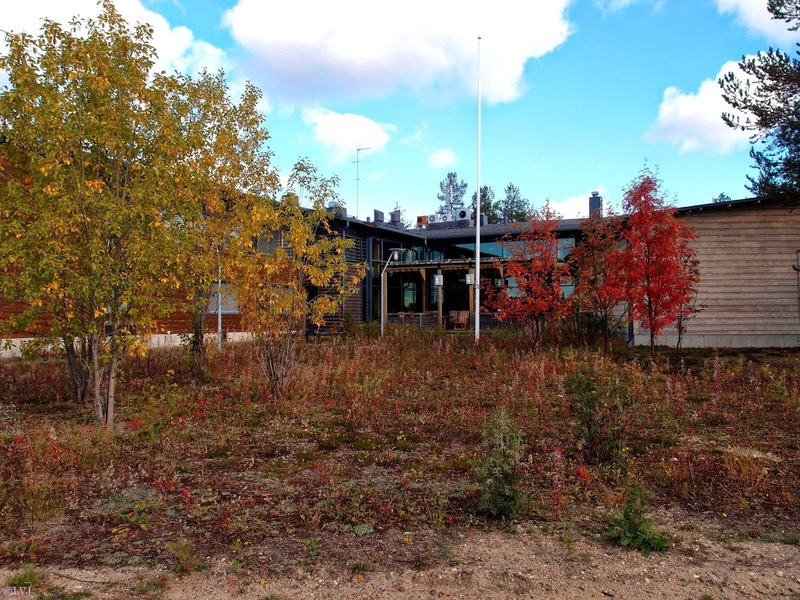 Since the early 2000s, Sodankylä Geophysical Observatory has shared the recent Polaria building with the Finnish Meteorological Institute, in the southern part of Tähtelä as well. Me allekirjoittaneet Katri ja Jouni Kataja lahjoitamme äidinisämme Ernst E. Leiniön maalaaman taulun Sodankylän Geofysiikan Observatoriolle. Taulu kuvaa observatorion päärakennusta siinä asussa kuin se oli kevättalvella 1952. Rakennuksen suunnitteli vuonna 1945 Suomen ensimmäinen naisarkkitehti Wivi Lönn. Isämme Eero Kataja toimi observatorion johtajana vuosina 1950-1992 ja äitimme Hilkka Kataja (o.s. Leiniö) sen emäntänä 1950-1955. Ernst Edvard Leiniö (1893-1962) vietti useita kuukausia vuonna 1952 Sodankylässä ja maalasi tällöin viimeiset taulunsa – Parkinsonin tauti lopetti sekä hänen puusepän että maalarin uransa. Koska tällä taululla ei ole enää meidän jälkeläisillemme samaa henkistä merkitystä kuin meille, haluamme luovuttaa sen laitokselle, jolle se aiheensa perustella mielestämme lähinnä kuuluu. We the undersigned Katri and Jouni Kataja donate a painting made by our mother's father Ernst E. Leiniö to the Sodankylä Geophysical Observatory. The topic of the picture is the main building of the observatory as it was in the early spring of 1952. The building was designed in 1945 by Wivi Lönn, the first Finnish female architect. Our father Eero Kataja was the director of the observatory in 1950-1992, and our mother Hilkka Kataja (née Leiniö) was its hostess in 1950-1955. Ernst Edvard Leiniö (1893-1962) spent several months in Sodankylä in the year 1952 and during that time he painted his last pictures – Parkinson's disease ended his career both as a carpenter and as a painter. As this painting does not have the same spiritual meaning to our progeny as it has to us, we want to donate it to the institute to which we think, because of the topic of the painting, it rightly belongs. Unveiling the painting (Photo: Maxime Grandin). 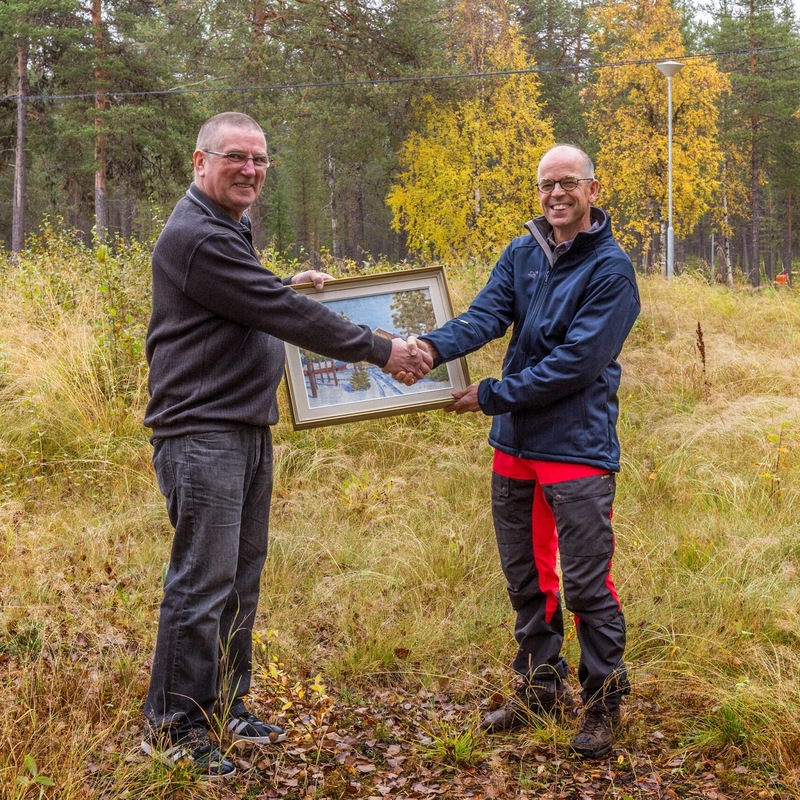 Esa Turunen receiving the painting from Jouni Kataja (Photo: Thomas Ulich). 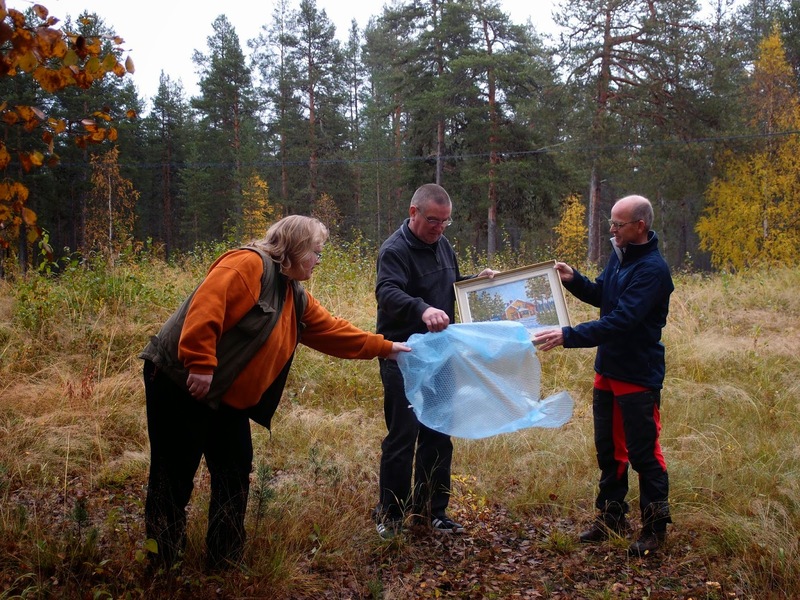 In the name of Sodankylä Geophysical Observatory, we warmly thank Katri and Jouni Kataja for their very kind and touching donation. 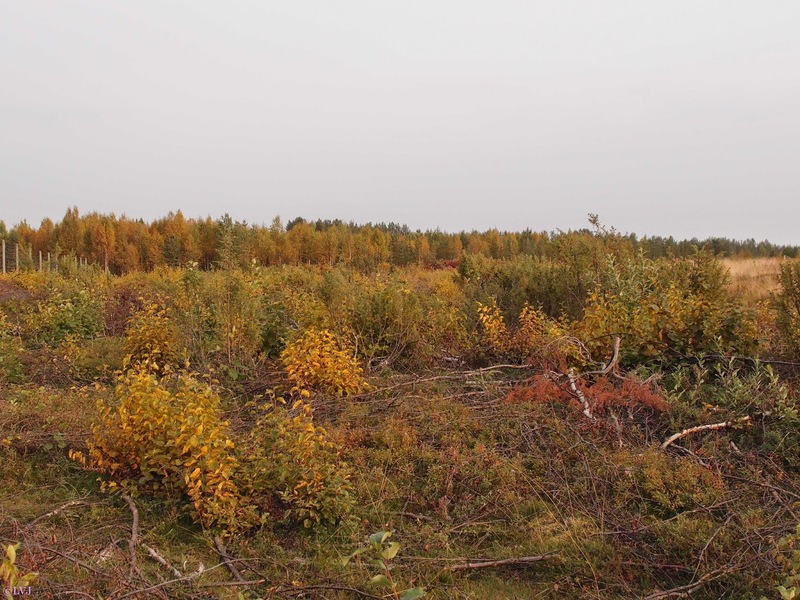 Here are a few color pictures of ruska in Tähtelä as well as other places in Sodankylä. 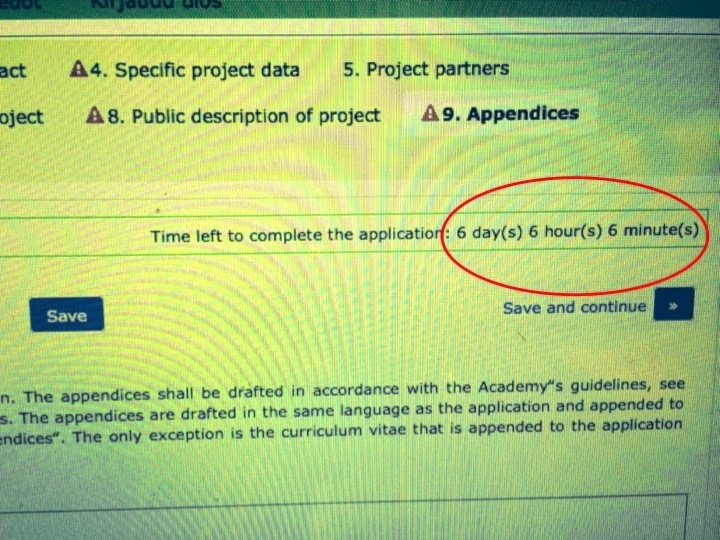 Academy of Finland: "The non-negotiable deadline is Wednesday 24 September 2014 at 16.15" . 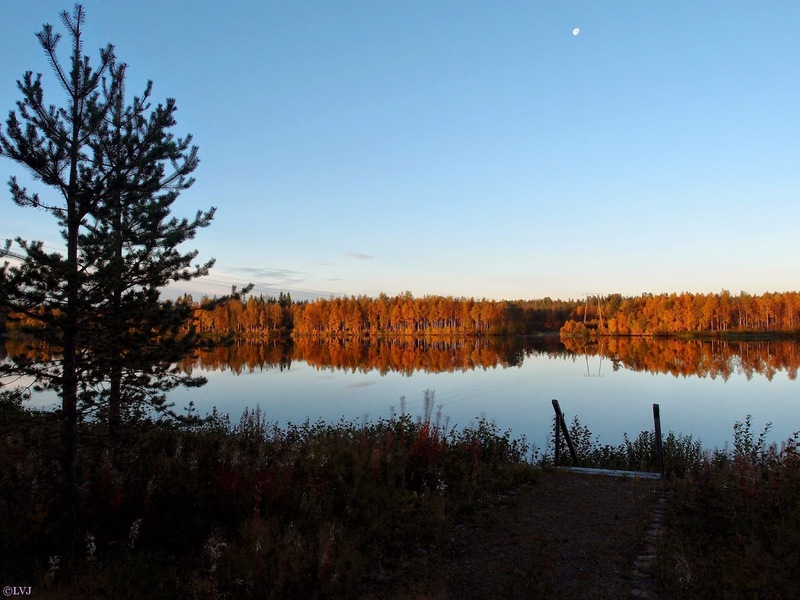 In Finnish Lapland, mid-September is well-known as the ruska time of the year, when leaves turn orange or red and the ground itself shows golden shades. It is the best time for mushroom and bilberry picking. Ruska only lasts for typically a few weeks. 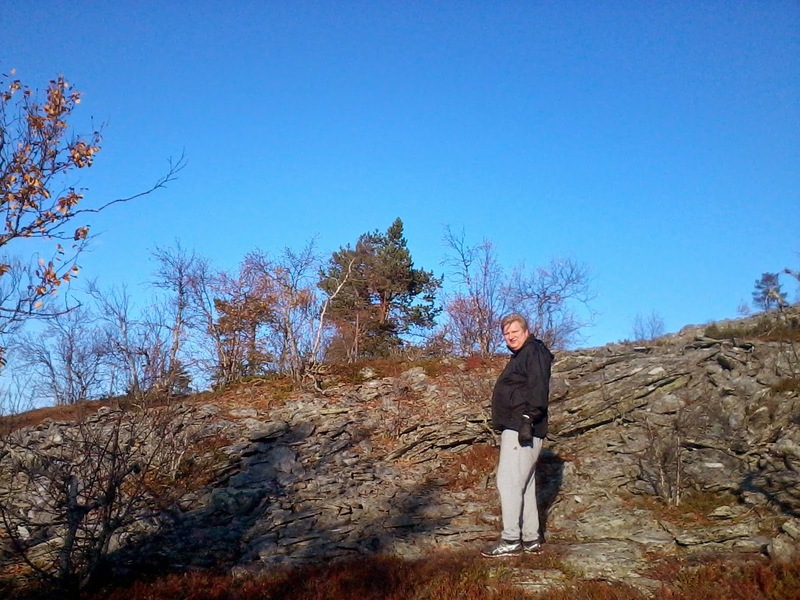 Mosquitos are (almost) gone, temperatures are still warm and days are still long, allowing very pleasant walks in forest. It is also the season when the hunting activities are increasing. 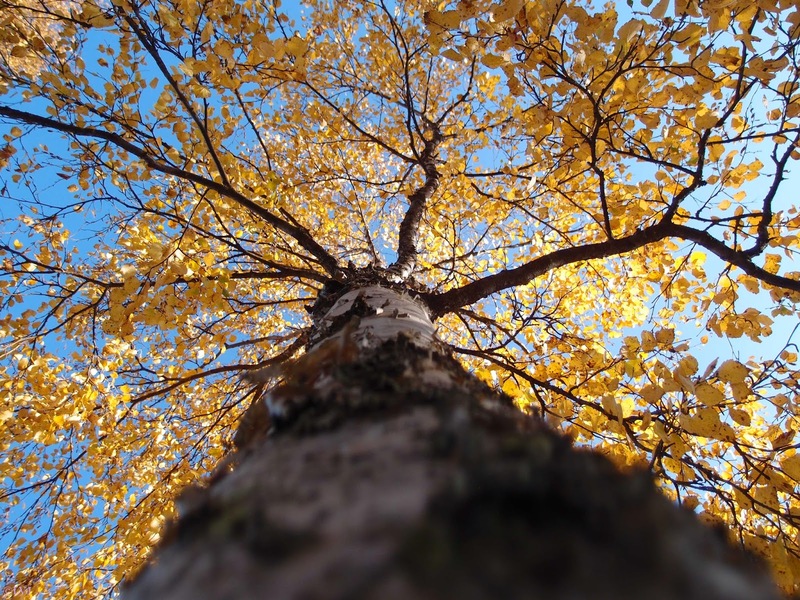 Every year, ruska occurs at the same period, as it is triggered by the drop in the daily amount of natural light reaching the trees. 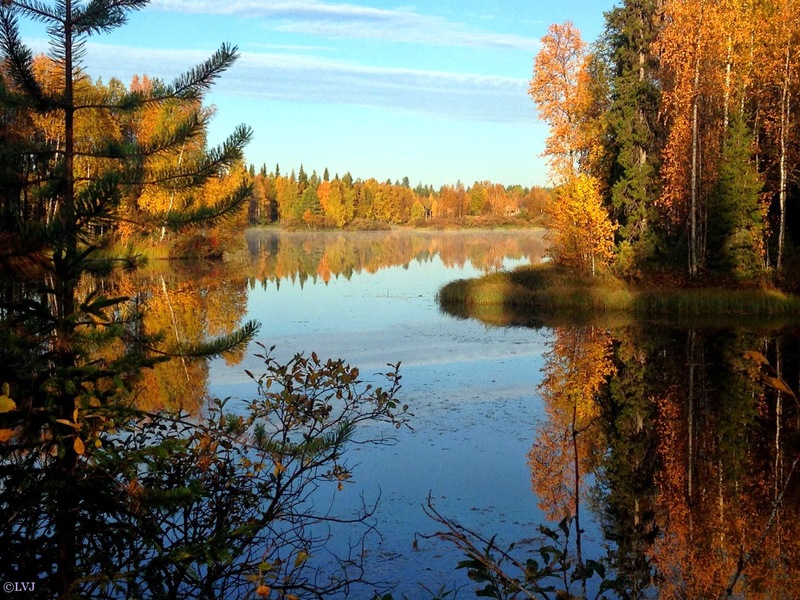 In Sodankylä (and therefore in Tähtelä), ruska reaches its climax during the second and third weeks of September (the official starting date and time are still actively debated). However, some years show a better ruska than others. 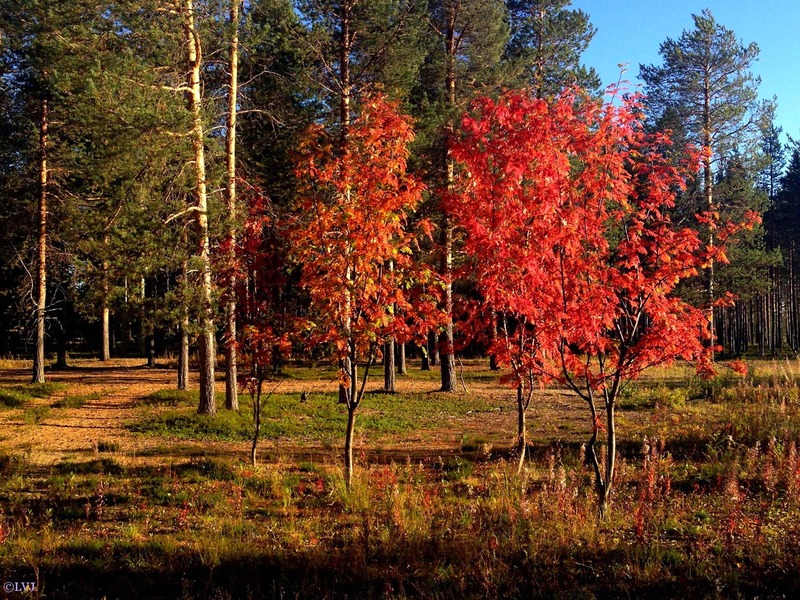 To have a good ruska with outstandingly colourful displays, the air must be rather dry in late August and early September, and slightly freezing temperatures are required at night. 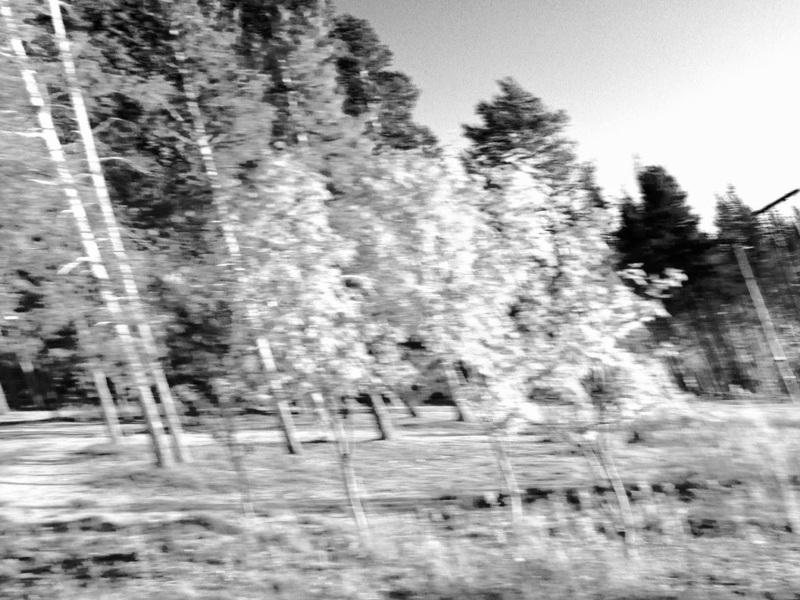 This was not the case this year in Sodankylä, and leaves therefore tend to fall from the trees as soon as their colour changes. Yet, the landscapes still prove breathtaking. In a week or so, most of the remaining leaves will start to fall. Then, after the equinoxe, days will become shorter and shorter; evenings will soon get darker and darker, nighttime temperatures will drop below zero. And within less than one month, there will be the first snow falls. The SGO tomography chain has been an operational instrument since early 2003, i.e. 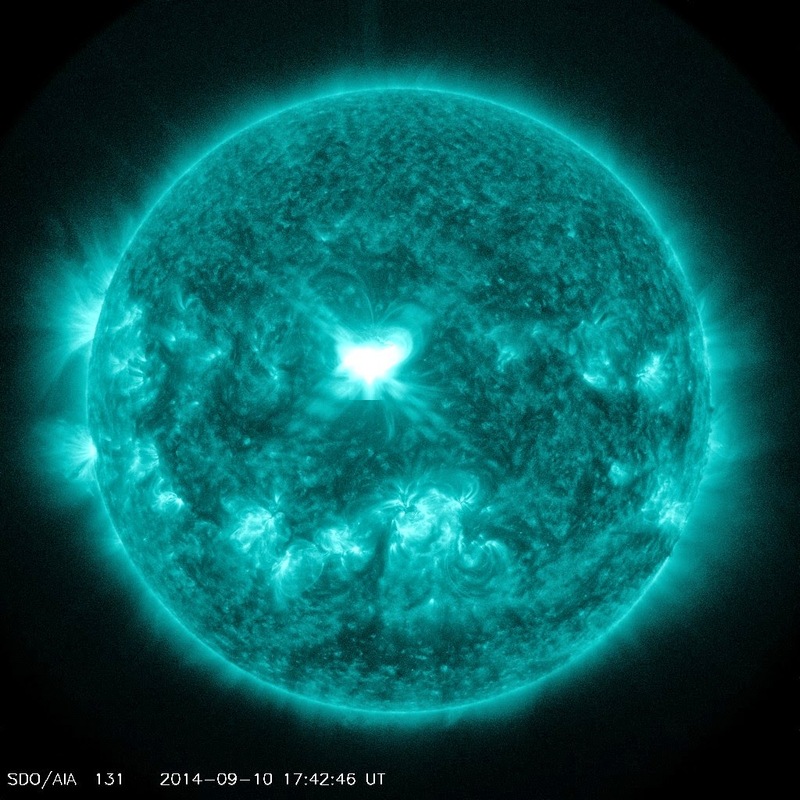 today autumn 2014, we have had one solar cycle of continuous observations. Before 2003, we did make technology and analysis development and related experiments. Early trials date back to 1990s. 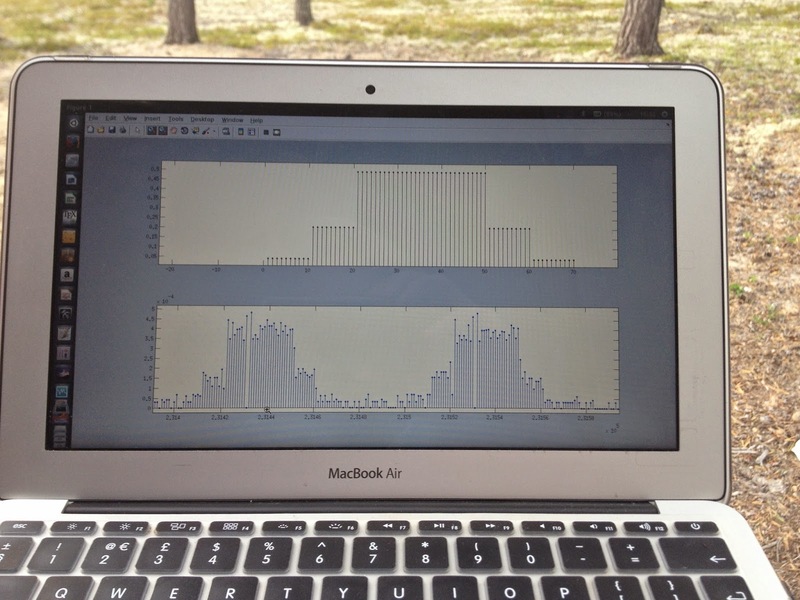 The basic data products are the phase curve measurements from 4-5 stations. The operational stations are: Nurmijärvi and Kokkola in Finland, Luleå and Kiruna, in Sweden. Tromsø station in Norway was used in the early phase of the chain and it was later replaced by the Kilpisjärvi receiver. The phase curves are basically total electron content plus an additive unknown constant. As analysis products, we have produced a large set of tomographic reconstructions. 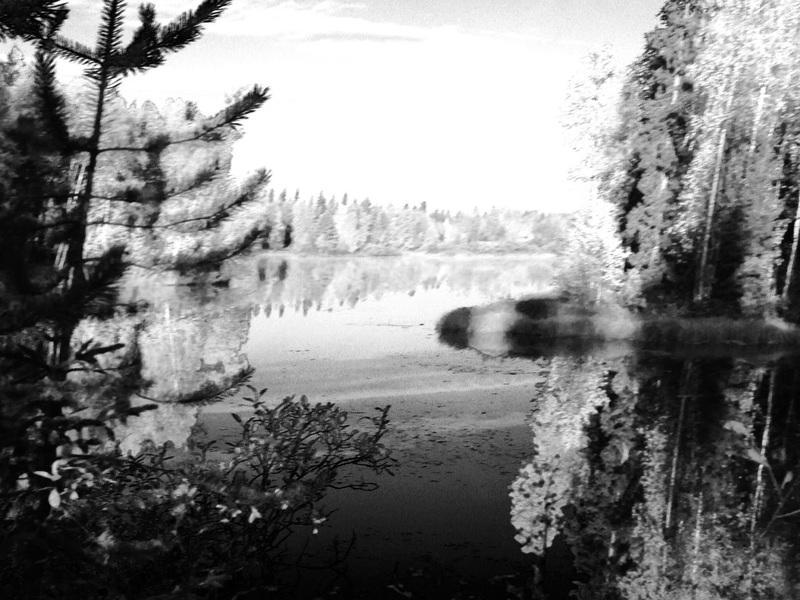 As mentioned earlier in the blog, we are continuing the tomography development in collaboration with Finnish Meteorogical Institute in a project titled ‘TomoScand’. Hence, the development is active and we hope to be measuring also during next years, and hence having data for 1+ solar cycle! 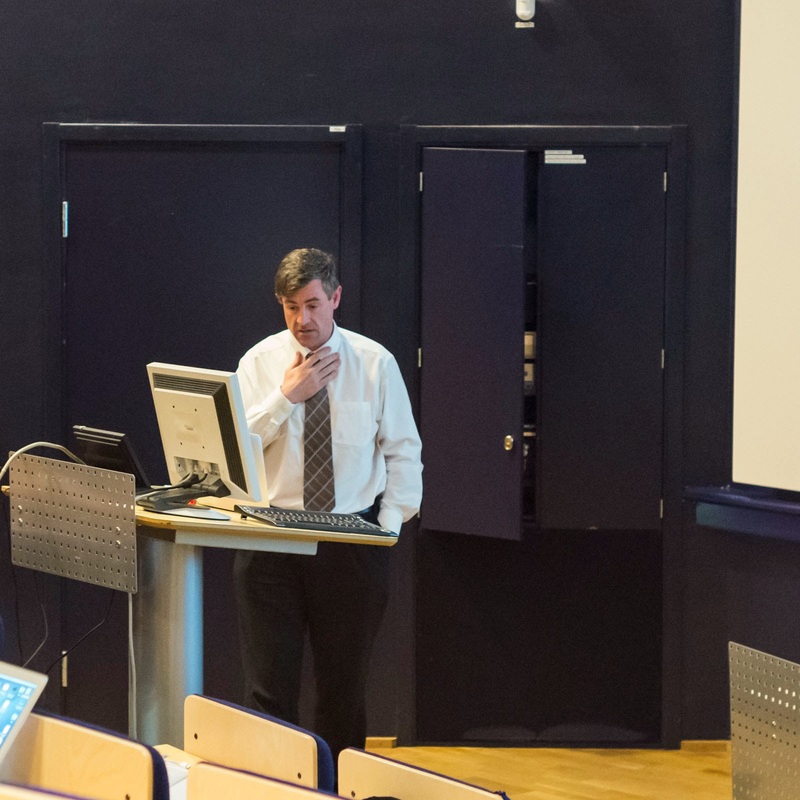 The EISCAT_3D Preparatory Phase Project is coming to an end and the End of Project Summary Meeting was held on 10.-12.9.2014 at IRF (Swedish Institute of Space Physics) in Kiruna. Here are some photos from the event. McKay-Bukowski, D.; Vierinen, J. ; Virtanen, I.I. ; Fallows, R. ; Postila, M. ; Ulich, T. ; Wucknitz, O. ; Brentjens, M. ;Ebbendorf, N. ; Enell, C-F. ; Gerbers, M. ; Grit, T. ; Gruppen, P. ; Kero, A. ; Iinatti, T. ; Lehtinen, M. ;Meulman, H. ; Norden, M. ; Orispaa, M. ; Raita, T. ; de Reijer, J.P. ; Roininen, L. ; Schoenmakers, A. ;Stuurwold, K. ; Turunen, E.
The Kilpisjärvi Atmospheric Imaging Receiver Array (KAIRA) is a dual array of omnidirectional VHF radio antennas located near Kilpisjärvi, Finland. 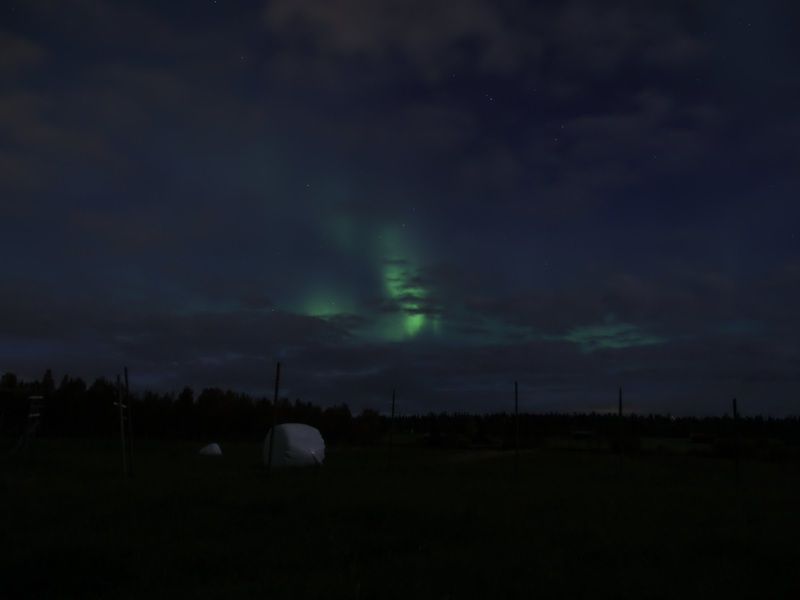 It is operated by the Sodankylä Geophysical Observatory. 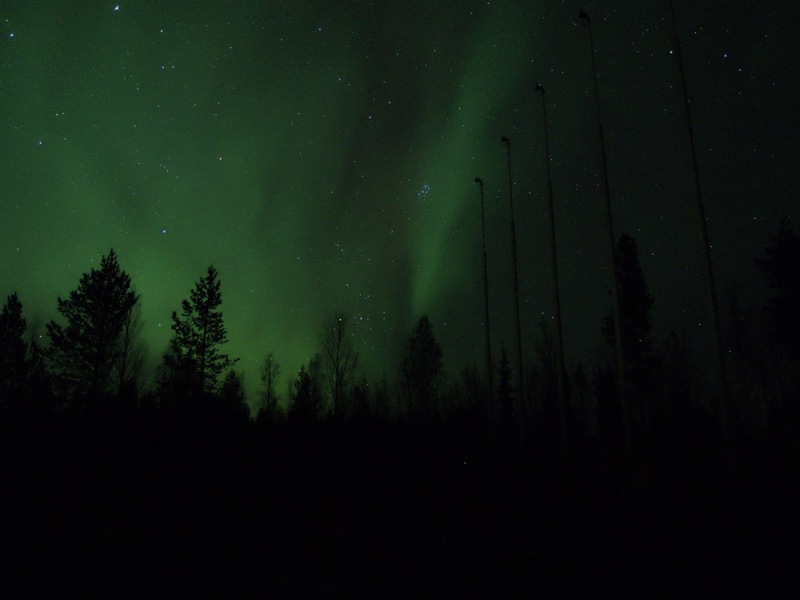 It makes extensive use of the proven LOFAR antenna and digital signal-processing hardware, and can act as a stand-alone passive receiver, as a receiver for the European Incoherent Scatter (EISCAT) very high frequency (VHF) incoherent scatter radar in Tromsø, or for use in conjunction with other Fenno-Scandinavian VHF experiments. In addition to being a powerful observing instrument in its own right, KAIRA will act as a pathfinder for technologies to be used in the planned EISCAT_3-D phased-array incoherent scatter radar system and participate in very long baseline interferometry experiments. This paper gives an overview of KAIRA, its principal hardware and software components, and its main science objectives. 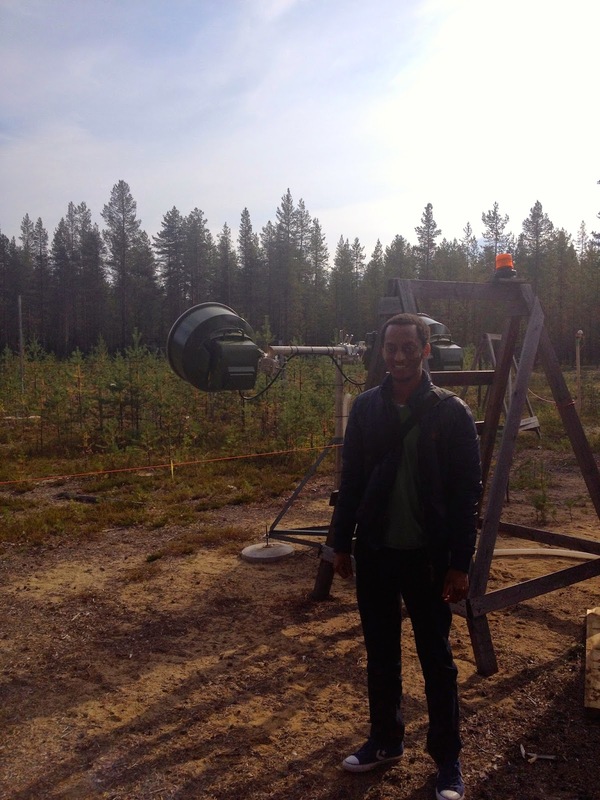 We demonstrate the applicability of the radio astronomy technology to our geoscience application. Furthermore, we present a selection of results from the commissioning phase of this new radio observatory. Keskiviikkoinen auringon X1.6-tason röntgensädepurkaus, joka siis liittyi koronan massapurkaukseen, tömpsähti maahan perjantaina alkuillasta. Shokkiaallon saavuttua magnetosfääri puristui kasaan. Observatorion magnetogrammissa mittasimme noin 400 nanoteslan muutoksen parin tunnin aikana. Revontulet tulevat näkyviin kun ionosfääriin tulee ionisaation takia voimakkaampia virtoja. Tämä näkyy magnetogrammin X-komponentin muutoksesta. Lisäksi ns. Bz-komponentin pitää olla negatiivinen. Sopivaa yhdistelmää revontulia varten saatiin odottaa melkein puolille öin. Silloinhan ne rävähtivät taivaalle. Markku Inkilä saikin napattua oheisen kuvan Inarin kunnassa. Lisää Markun kuvia näet täältä! Lauantai-illan tullen saatamme nähdä lisää revontulia! Sääennuste näyttää ihan kohtuulliselta, joskin Bz-komponentti on vääränmerkkinen. Toivotaan siis sen muuttuvan! 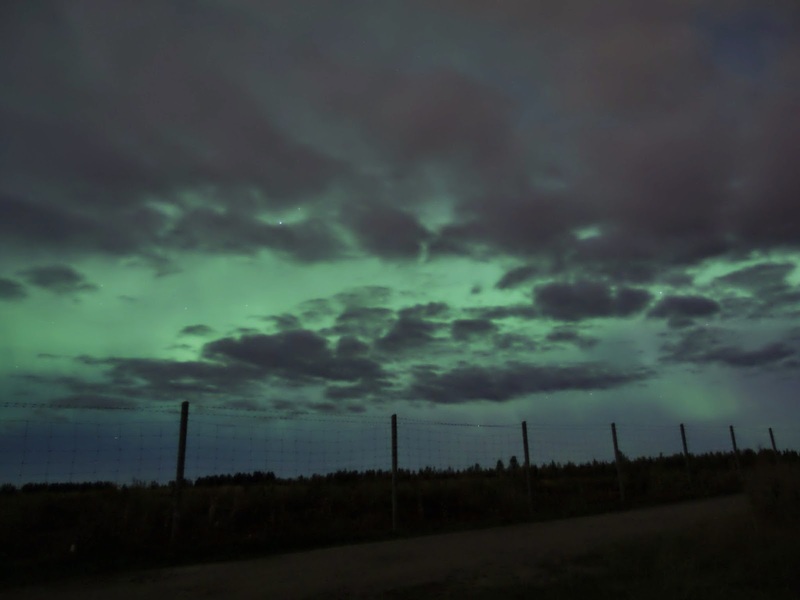 Although the beginning of the night was not very promising, the sky being almost overcast, I managed to take a few pictures of the northern light this night. 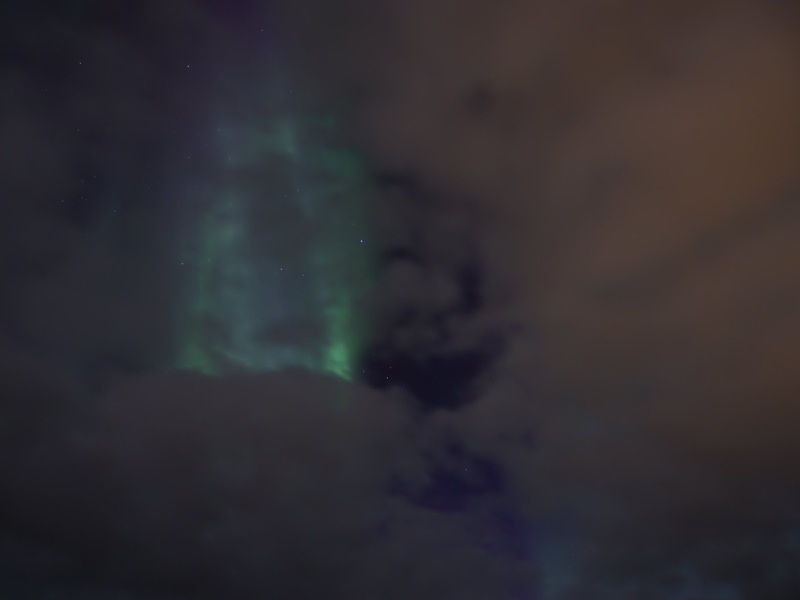 The sky started to clear up around 23:45 and some activity could be guessed behind the clouds. 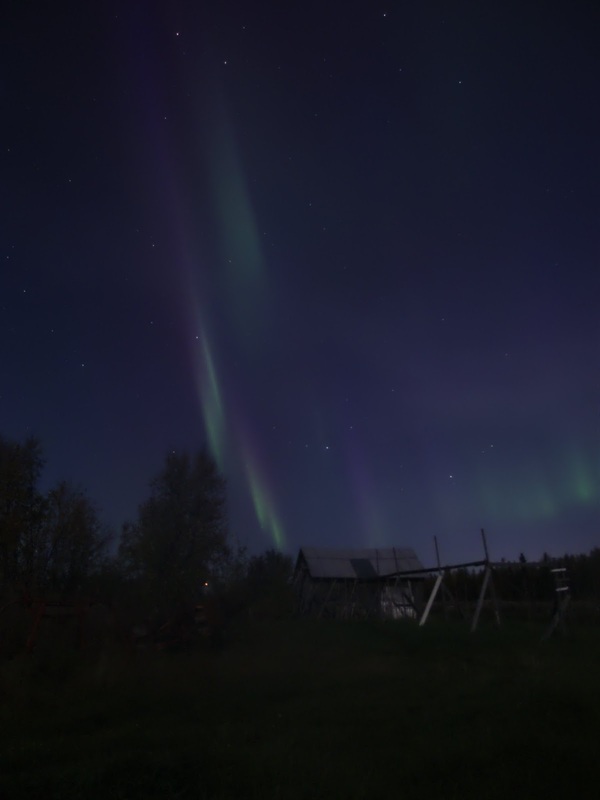 As the last clouds were drifting from the western horizon towards Sodankylä, a diffuse aurora appeared in the south. 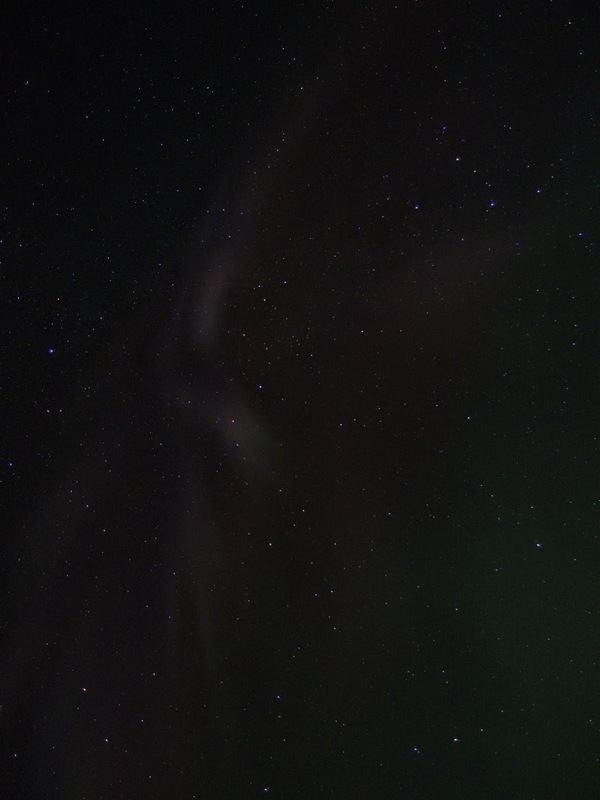 Around 1:15, a proper arc finally showed up, offering gorgeous displays of green and purple. 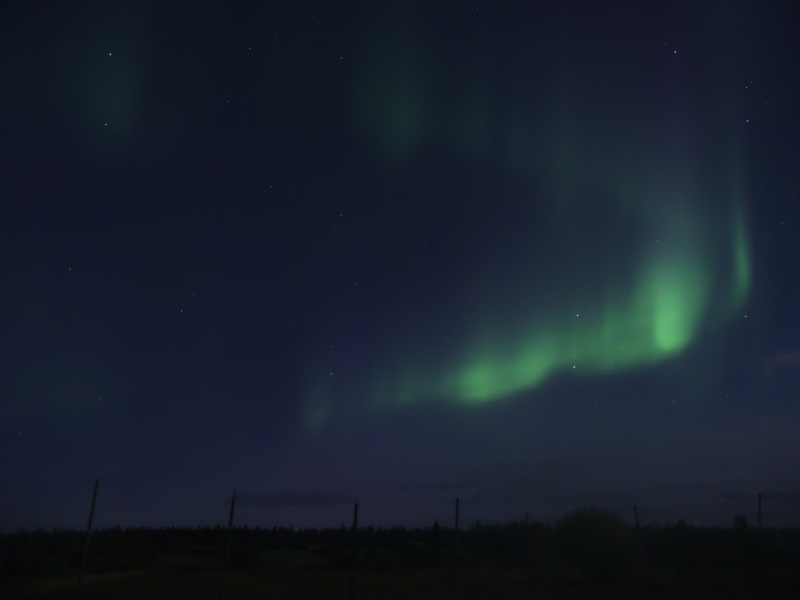 A few minutes later, a quite active arc appeared in the north. Unfortunately, it lasted only for a couple of minutes. Slightly tired and feeling cold, I decided to stop hunting a bit after 2:00. 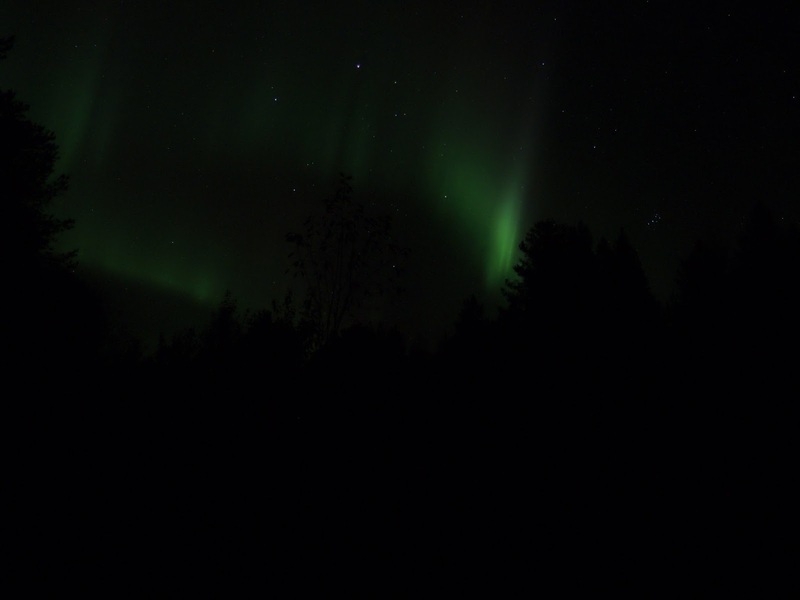 Finally, this night's displays were not as impressive as I had hoped, but they were still worth staying up to enjoy them. 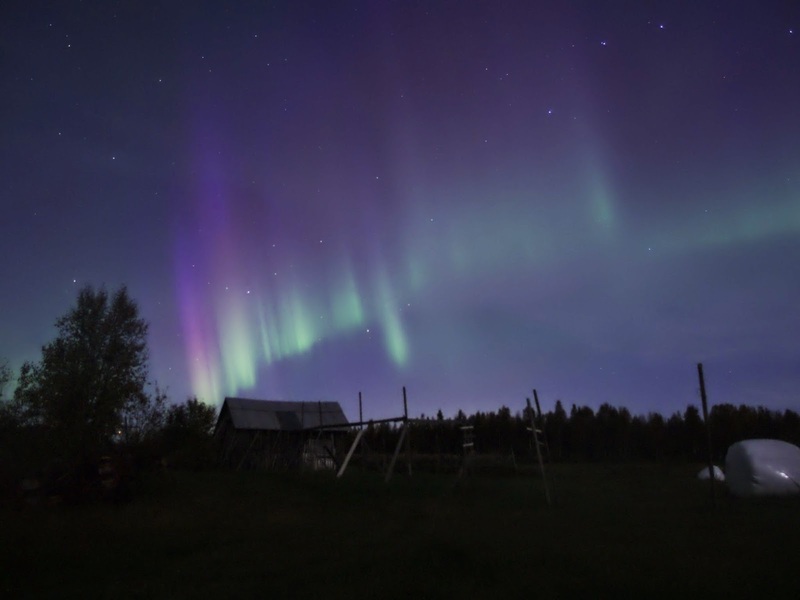 Tässä viime yön ~800 nT:n myrsky kuvattuna observatorion Ruotsin Abiskossa olevalla EMCCD-kameralla (vihreä viiva mitattuna). Pilvet hieman häiritsivät mittausta. Jotain tämmöistä tai itse asiassa vieläkin komeampia revontulia odottelemme illan pimetessä. Toivotaan sään pysyvän hyvänä ja magneettikentän Bz-komponentin sojottavan oikeaan suuntaan. 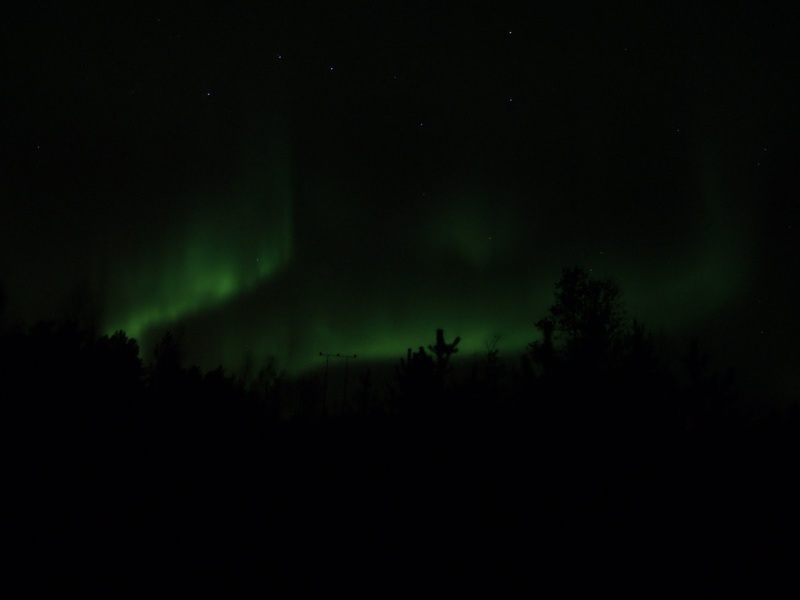 Here is last night's overview movie from the Abisko EMCCD (auroral green line). Unfortunately the sky was mostly cloudy and moonlit but in the end of the movie you can see the beginning of the substorm as also seen in the magnetogram. Unfortunately EISCAT mainland radars are non-operational due to a cooling system problem. 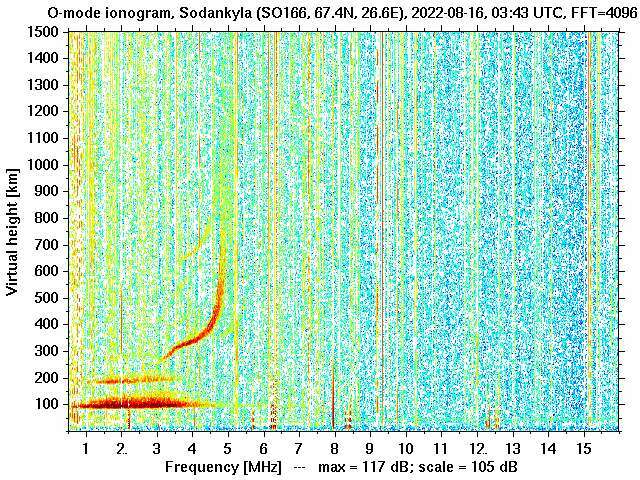 Hence, we will monitor the CME events with three instruments: 1) ESR Svalbard radar (real-time graph), 2) KAIRA, and, 3) TomoScand. Especially COSMOS 2414 13:30 is interesting! 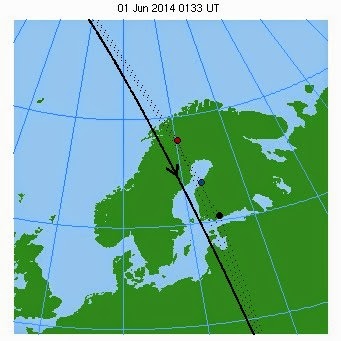 Sep 13 the COSMOS flights ~45 min later + trajectory a bit further in the west. CASSIOPE nearly same time and trajectory. 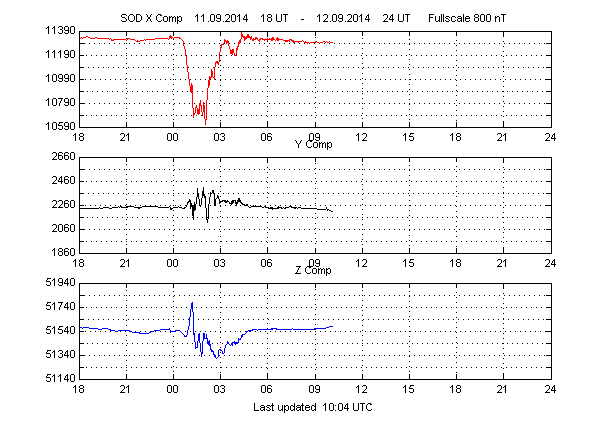 Last night a ~800 nT storm was measured at SGO. 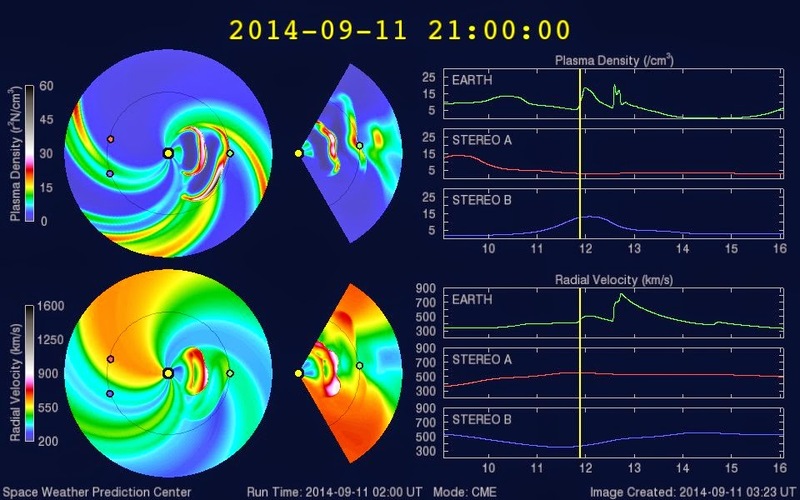 We expect the second CME impact and the storm this afternoon or later in the evening. 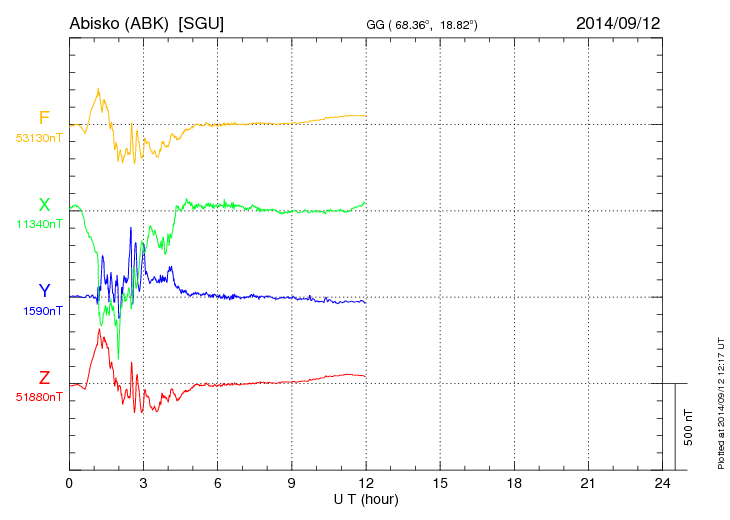 SGO real-time magnetogram and all-sky image here !! KAIRA is picking up today's flare activity. ... so only look at the last hour of GOES to compare. GOES real-time plot here !! 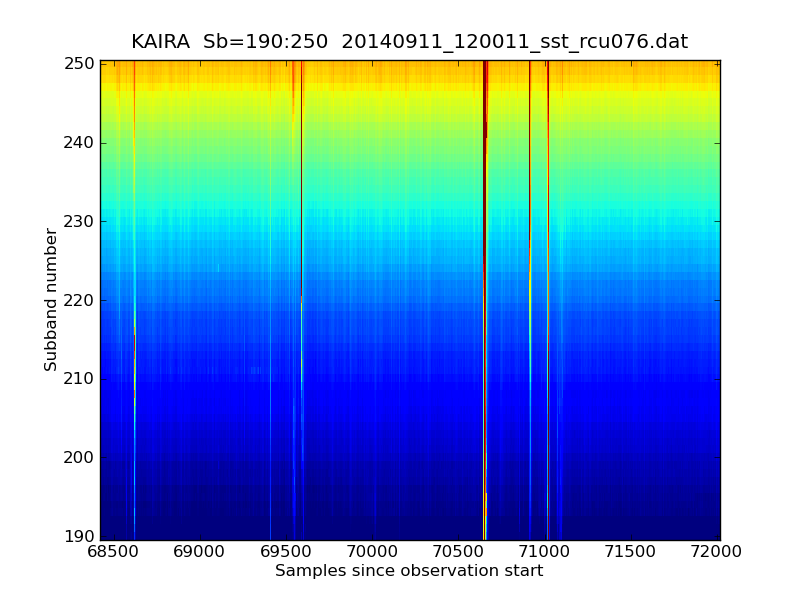 KAIRA real-time plot here !! Aurinko on lähettänyt viime aikoina revontulibongareiden iloksi kaksi voimakasta hiukkaspurkausta kohti maata (ks. animaatio täältä). 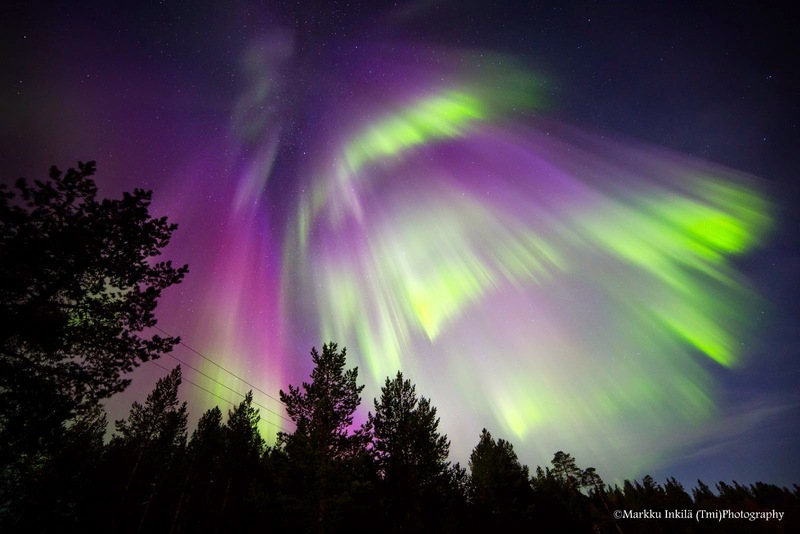 Jälkimmäisen purkauksen laajenemisnopeudeksi on arvioitu jopa 3750 km/s, eli se lähes saavuttaa hitaamman edeltäjänsä maan etäisyydellä auringosta. Toivotaan pilvetöntä taivasta. Ensi yön ennuste ei näytä kovin hyvältä, mutta perjantai jo paremmalta. Sodankylän geofysiikan observatorion koko taivaan kuvaavia revontulikameroita voi seurata pimeän aikaan reaaliajassa täältä. Auringosta välähti äsken voimakas X1.6-tason röntgensädepurkaus, joka luultavasti liittyy ns. "koronan massapurkaukseen". Suomeksi sanottuna tämä tarkoittaa komeita revontulia 2-3 päivän kuluttua, kun auringosta sinkoutuneet hiukkaset saavuttavat maan. Tässä on kuitenkin pari muuttujaa. Hiukkastuulen mukanaan kuljettama magneettikenttä saisi mielellään olla maan magneettikentälle vastakkaissuuntainen. Reaaliajassa tätä pääsee pääsee jännäämään suoraan satelliitista: punaisella piirretyn Bz-käyrän soisi siis olevan negatiivinen, jotta auringosta tulevat varatut hiukkaset pääsisivät tunkeutumaan maan magnetosfääriin aiheuttamaan revontulia. Toinen mutta matkassa on tietysti mahdollinen pilvisyys, mutta juuri nyt ennuste ei näytä ihan toivottomalta sekään. Eli peukut pystyyn ja seurataan tilannetta! In geophysics, a widely used concept "L-shell" describes how some given location on the ground maps to the magnetosphere along the magnetic field line. Starting from any given location, and following its magnetic field up to the equator plane of the Earth's magnetosphere, the L-value is the distance to that point in Earth's radii (Wikipedia). 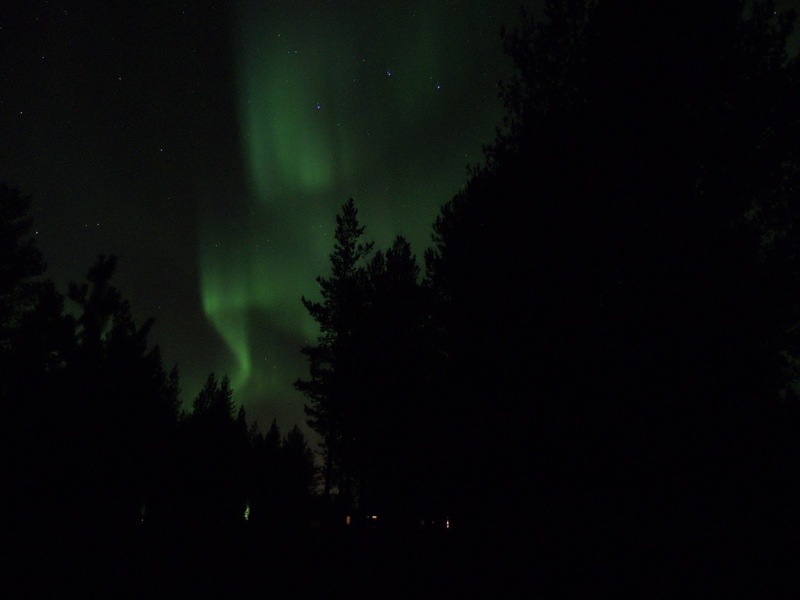 Aeronomy research at the SGO is focused on the effects of the energetic particle precipitation from the magnetosphere to the atmosphere. Our long-term ground based instruments (see the map below), such as riometers and pulsation magnetometers, are ideally located across the most interesting L-shells, covering Van Allen Radiation Belts (L=1.5-2.5 and 4-6), auroral oval (L~6) and even the polar cap (L>10). Today is Professor Markku Lehtinen's 60th birthday. 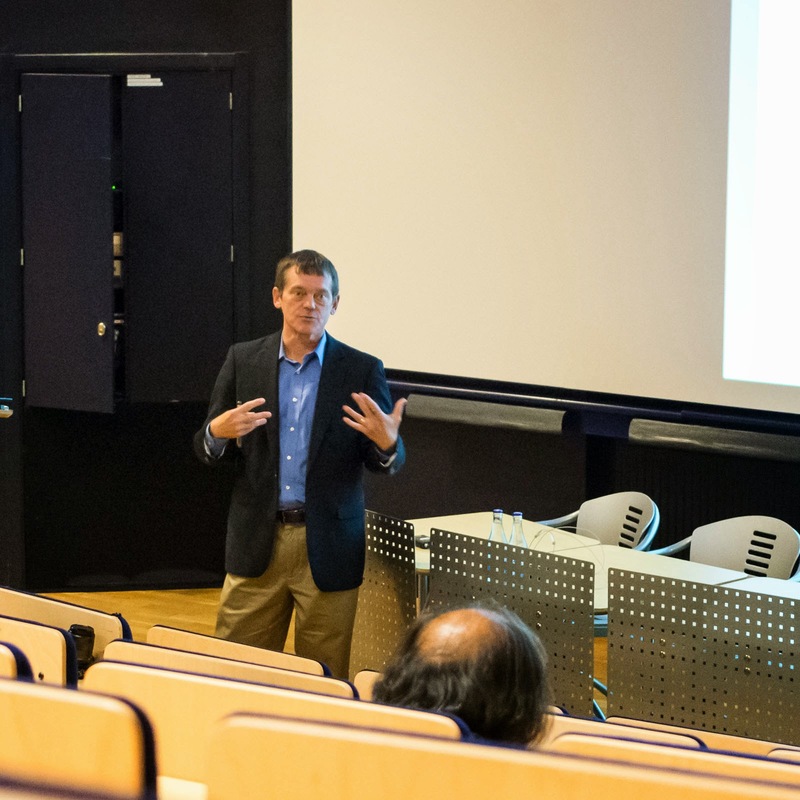 Professor Lehtinen is considered as founder of the Finnish inverse problems research. His most known contributions include the alternating coding technique for incoherent scatter radars. 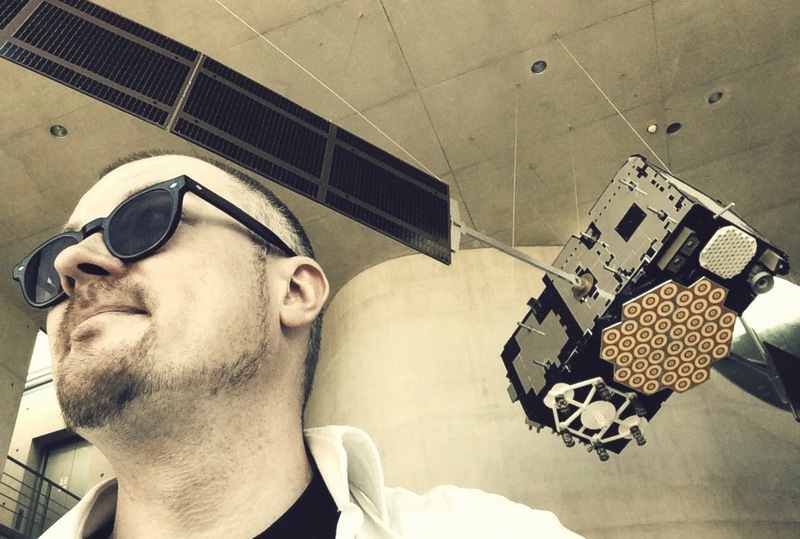 At the moment, Professor Lehtinen is in charge of the signal- and hardware-design of the next generation distributed phased-array incoherent scatter radar, EISCAT_3D. 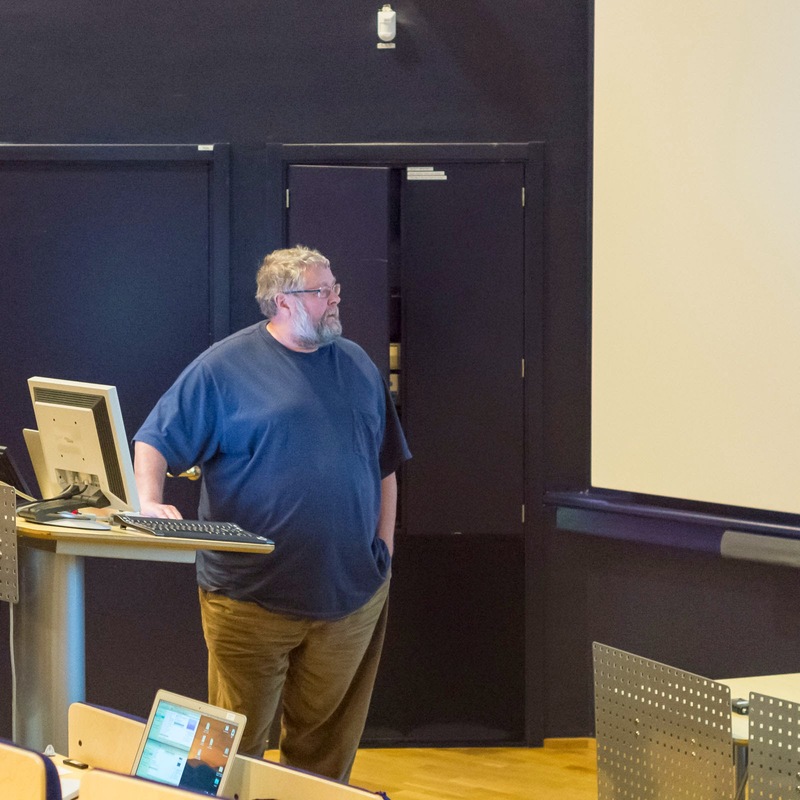 From 21 to 26 July, the National Science Foundation and the EISCAT Scientific Association organised the 2014 Incoherent Scatter Radar Summer School in Arecibo, Puerto Rico. The Finnish delegation comprised Thomas Ulich (lecturer and organiser, SGO), Antti Kero (lecturer, SGO), Anita Aikio (lecturer, University of Oulu) and myself (student, SGO). 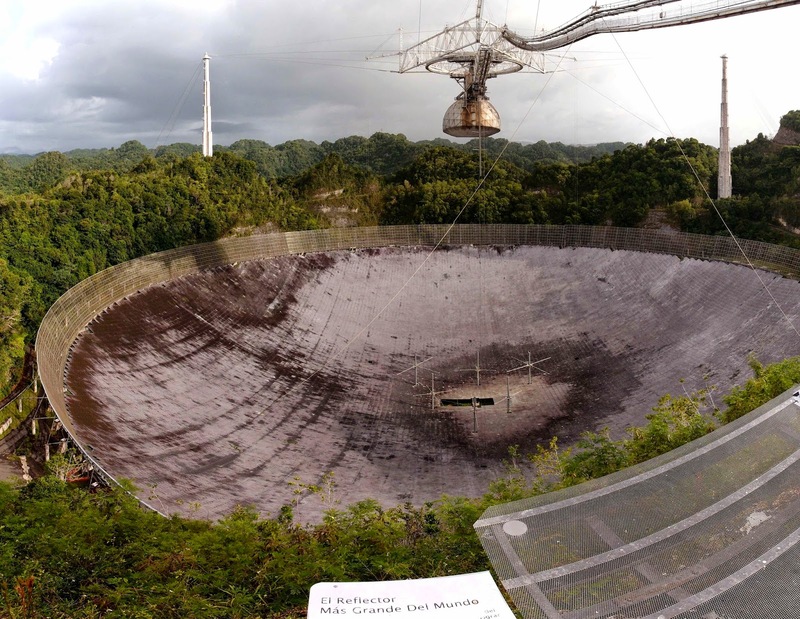 It was such an incredible experience to have this summer school in the legendary Arecibo Observatory by the very edge of the 305-m-wide spherical dish which was built in 1964. 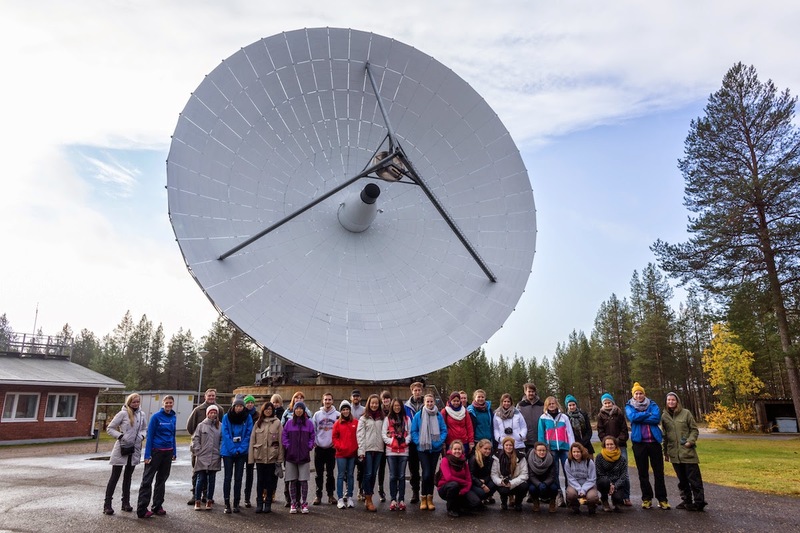 This radiotelescope has provided the scientific community with extremely high-quality data in ionosphere physics, radio astronomy and planet and asteroid imaging. The platform hanging 150 m above the bottom of the dish thanks to strong cables contains two receivers: the line feed and the Gregorian dome. The access to the platform is visible on the top-right-hand corner of the picture below. During the week, the summer school participants were given the chance to get onto that platform. Besides the amazing location, this summer school was a great success and provided a unique opportunity for students in ionosphere physics from all around the world (Europe, United States, Japan, China, Peru, Ethiopia...) to meet. Many thanks to the organisers and the lecturers (may they find an equally extraordinary place for the next summer school)! It was a rather busy week with the X-band radar installation. The outcome was excellent, i.e. 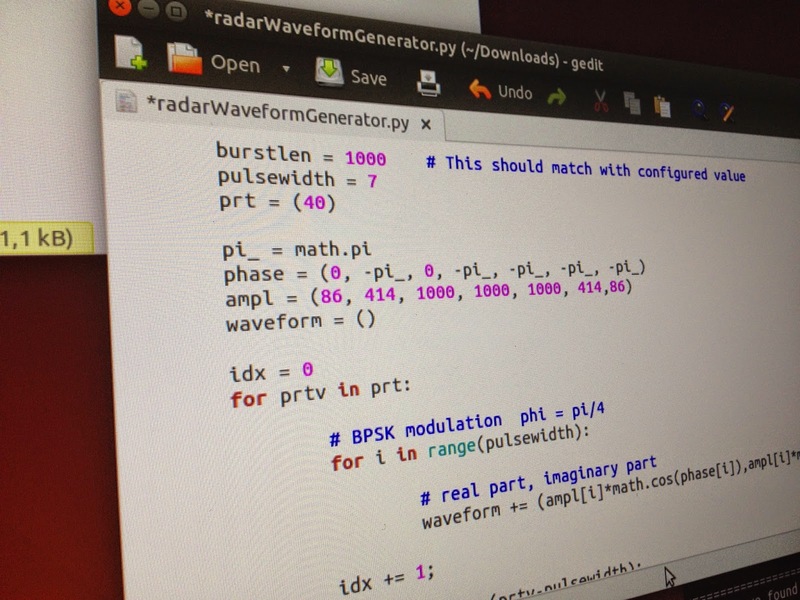 a fully working X-band weather radar. Transmission coding and receiver system rely heavily on the USRP technology. Hence, we decided to call this project 'SoftRadar'. Below you may find the interface and SoftRadar experiment design system. We will continue the development at some suitable point after we have gained some further experience on using the system! 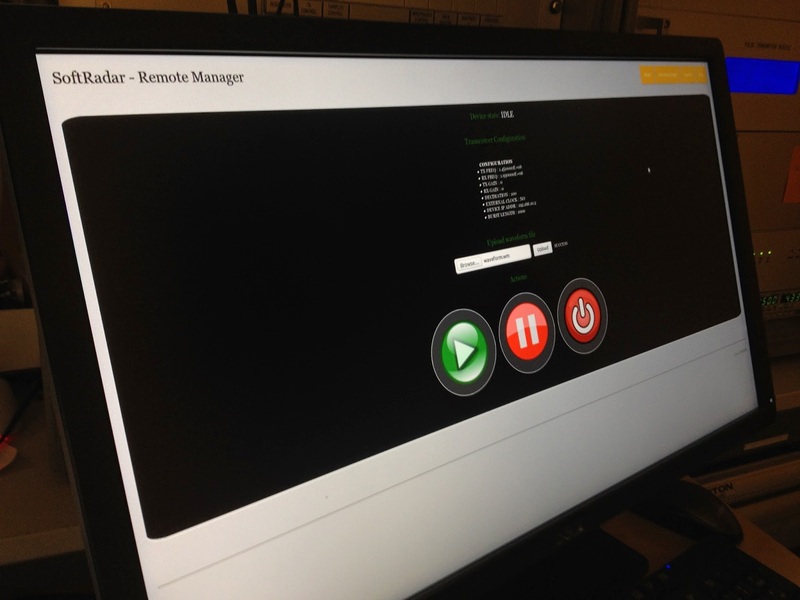 design and implementation for the SoftRadar!